Mount Washington Observatory to join Ice Fest! This morning we are very excited to announce that the Mount Washington Observatory will be joining us at Ice Fest this year! The OBS is a staple of the winter-in-the-Whites scene, providing us with one of the most important resources we have for planning our adventures – the forecast! 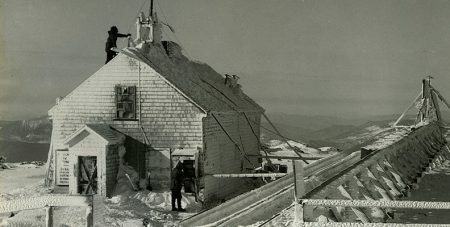 While scientists began exploring and observing winter on the summit of Mount Washington in 1870, the Mount Washington Observatory itself was founded in 1932 and has been forecasting and keeping records ever since. Only two years after its founding, scientists in the Observatory recorded the famous 231 mph gust that stood until 1996 as the fastest wind gust ever recorded on the surface of the Earth. The Auto Road Stage Office was where the Observatory was first established. The weather station has been staffed continuously since 1932, with crews taking hourly weather observations that are reported to the National Weather Service for use in regional forecasting. 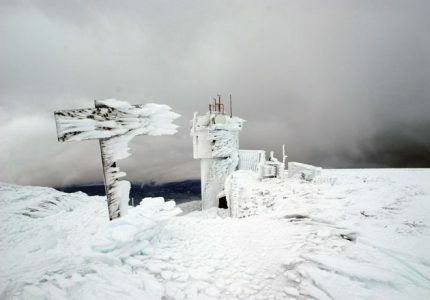 With this long-standing tradition of data collection, the Mount Washington Observatory holds one of North America’s longest continuous climate records. Today, the mountaintop weather station remains the core of the observatory’s work, but in addition to the weather and climate research it conducts, the OBS also focuses heavily on science education and interpreting the region’s heritage. Perhaps most importantly to us climbers, they issue a daily forecast for the Mount Washington region and the High Summits. An incredible resource! As you make your way through registration at this year’s Ice Fest, be sure to check in with the folks from the MWOBS. They will be at IME with a live stream of the summit weather, and will have all the information about what to expect from the elements out there! 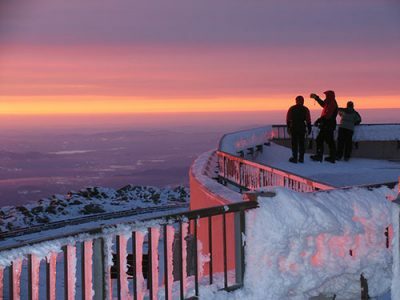 Ice Fest and IMCS have also partnered up with the Mount Washington Observatory to offer an ascent of Mount Washington that is complete with a night spent in the OBS bunkroom, a tour of the Observatory, and meals with the Observatory staff. A really unique and amazing opportunity! Unfortunately, this trip has already been booked and has no space remaining. CAMP & Ian Osteyee return to Ice Fest! Good morning folks! There’s a chill in the air and single digits in the forecast – it’s coming! 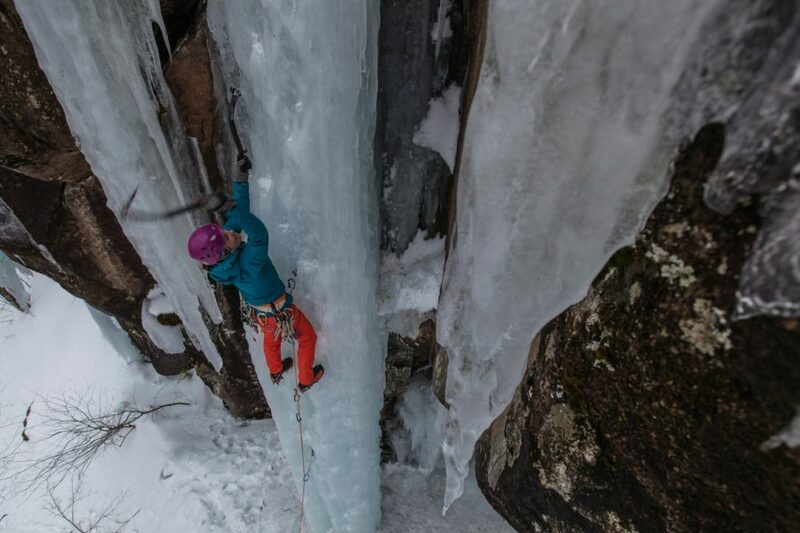 And if the thought of that early ice, that scrappy and thin climbing gets you psyched, well then this should too – Ian Osteyee and CAMP are returning again to the MVW Ice Fest! Ian is known among the Ice Fest circles as a guru of thin ice, somehow always being able to levitate his way up those climbs that are just barely “in”. He has been teaching our Climbing on Thin Ice clinic for years, and it’s increase in popularity is a true testament to the fun that participants consistently have out at climbing with Ian. Ian Osteyee, CAMP athlete and owner of Adirondack Mountain Guides, styles it on some wicked thin New York ice. Not only will CAMP be sending Ian to guide, they will of course be arriving with heaps of demo gear for Ice Fest participants to try out. 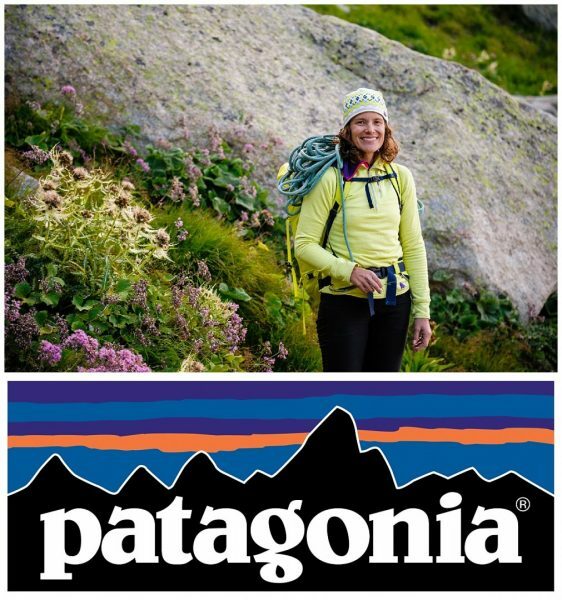 CAMP is well known for the innovative, lightweight climbing gear that they began designing 125 years ago in the mountains of Northern Italy. Be sure to grab some demo gear from them before heading out to try your hand at climbing thin ice, or any other of the Ice Fest clinics! And stay tuned for more news coming from CAMP this season! Welcome back, Ian & CAMP!